Château Saint Pierre most likely dates back to the 11th century. Recent rehabilitation work in the cellar has turned up ruins of a church dedicated to Saint Pierre that had belonged to Foulques, the lord of Les Arcs. This priory and the land around it were bequeathed to the Saint Victor Abbey in 1055 and later became a country estate belonging to the Les Arcs parish. Handed down from father to son for the past four generations, the château features vineyards of mostly noble grape varieties (AOC designation). The winemakers at Château Saint Pierre are ever attentive to the extreme importance of the local soil and have always maintained natural methods of cultivation that allow the wines to produce their best. 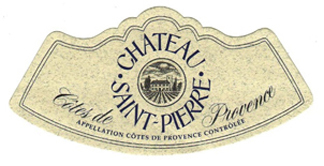 By combining various technological advances with a traditional vinification process, Château Saint Pierre has achieved its major objective: preserving the distinctiveness and quality of its wines. Production has been intentionally limited to guarantee high quality. Provence is a wine region in the far south-eastern corner of France, best known for the quality (and quantity) of its rosé wines - 88% of the region’s production is Rosé! Provence is blessed with a fantastic climate, especially for grapes! The region gets lots of sunshine and not too much rain with warm days and cool evenings. The Mediterranean moderates the temperatures and the famous “Mistral” wind keeps the vineyards dry, free of pests and the skies clear.